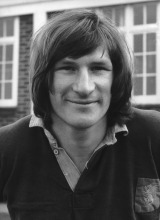 Ripley won 24 caps between 1972 and 1976, scoring two tries, and was selected for the triumphant 1974 Lions tour to South Africa. He did not begin playing rugby until he was 19-years-old and continued until he was 41, spending his whole career at Rosslyn Park. The hard-running No.8 was a brilliant all-round athlete, competing in the 400m at the UK athletics Championship, and was world veteran indoor rowing champion. He found further fame on the BBC Superstars show that was a perfect showcase for his all-round sporting skills. A chartered accountant, Ripley was a colourful and popular figure who received an OBE in the 2010 Birthday Honours List. At the age of 50 he gained an MPhil at Cambridge University and even tried out, unsuccessfully, for a place in the Boat Race crew. He was also an exceptional seven-a-side player and won the inaugural World Cup Sevens with England at Murrayfield in 1973. In addition to his many other talents, Ripley was a fluent linguist and worked as a rugby commentator for French television. Initially diagnosed with prostate cancer in 2005, he appeared to have made a recovery by 2007 only for disease to return the following year and most recently spread to his skull and affected the optic nerves. In the last five years of his life he worked as an ambassador for the Prostate Cancer Charity. He finally lost his battle cancer in 2010 shortly after having received the Blyth Spirit Award for outstanding courage in the face of adversity at the Rugby Players' Association Awards.